Finding Your Faith Bible Study Series is a continuous bible study designed to increase your faith in the Lord, We want you to have the kind of faith that can move mountains. This study was created by Rev. Penny Dean. It is the beginning of her inspiring testimony of faith series. Whether you are unsure of the Lord's awesome power or confident in your walk with Christ this series of faith testimonies are sure to touch your heart, in more than one way. Enjoy. Scroll down to do this Lesson and take the pop quiz. By Rev. Penny Dean. Photo: Robin Pence. Go to Part 2 by clicking on the button below the quiz button or follow the link-Part 2: There's your Sign! ​Scroll down to start this bible study now. Finding your Faith is part of a unique bible study which uses the inspiring testimony of renowned Christian minister Rev. Penny Dean who was blind in one eye and was healed in accordance with her faith and how much she believed at the time. Faith is a vital step in the Christian walk with the Lord. If you do not have faith, it is impossible to have and develop a relationship with God. Faith is built on trust, you must trust that God will do what He says He will do. Don’t expect a miracle if you do not have faith. Believing in something even if you can’t see it at the time can be quite difficult at times. For example, if you have fasted, prayed, and asked in Jesus Christ’s name for healing of a particular illness, yet you still have symptoms of the illness, it can be difficult to understand that you may have already been healed and that the symptoms may still be there because the devil wants you to think you have not been healed and thereby shaking your faith and trust in the Lord’s complete, divine ability to heal you. So, not only do you have to have faith when you ask God for something but you have to see it through by continuing to have faith while you await your miracle. In order to have faith we have to believe in something even when there does not seem to be any proof of it at the time. This means that the things that we hope and pray for will happen, if only we just believe that the Lord has the power to make them happen and that they will actually happen when you pray and speak them into existence. Jesus (Yeshua) said that we can ask any thing in His name and He will do it. Of course, you know you can not ask for sinful things or desires. However, you can ask and if the Lord sees fit to do it for you He will do it if what you ask is in line with His will for you. And even when you ask, you don't get it because your motives are all wrong--you want only what will give you pleasure. The object is to please God and asking with wrong motives displeases Him therefore He will not answer your prayers. I will give you an example from my life. When I was about 8 or 9 years old, I started having trouble with my eyesight in my left eye. I told my mother and grandmother about it and they took me to an eye doctor, he could not figure it out! The eye doctor said I was blind in my left eye and that it was permanent. I could not see and the doctor sent us to a specialist in Madison, Wisconsin. Many tests were done and it was determined that I was in fact blind in my left eye. The eye doctor had made it perfectly clear that there was no hope whatsoever that my eye could heal because a tube in the back of my eye that carries fluid to it, had broke somehow,the fluid had drained out and the tube had shriveled up. It was useless.There was nothing they could do to help me.My grandmother and great grandmother prayed for my eye. I believed in God but I was too young and uninformed to realize the power that my great grandmother often spoke of. Then everything changed. When my family came up with a plan to take me to my Aunt's church in Necedah, WI. I was warned before we arrived at the church, that these people were different than ordinary Christians because they could actually harness the Lord's awesome power and that God would heal my eye. It was a long drive from Kenosha, WI. to Necedah, WI. All the way there, they spoke of this power that this church had. When I left there I would be fine, they assured me. I heard a few comments from one skeptical relative saying, "Yeah, sure it will." with the distinct feeling that they did not believe that I would be healed at all but I did not let that deter my faith. We finally arrived at this special church and my great grandmother pulled me to the side, telling me. "If you expect this to work you have to love the Lord with all your heart, you have to be saved and you have to believe that Jesus can heal you, no matter what anyone says!" We went into the church. The healing began.They began to pray and speak in tongues! I kept thinking, I believed in the Lord I believed Jesus died for my sins. I believe I will be healed no matter what anyone says! It was very intense and I will never forget it!During the prayer, someone took me outside saying, "This is too much,this is crazy it will never work." I looked at her as if in a daze because indeed I did feel the power moving through me and in me and I will never forget it.Everyone started calling out to us telling us, “We are not finished come back in”. We left. I felt as if my healing had started but was incomplete..that is what I believed! Not long after this, my mother took me to the eye doctor because I kept telling her I could see.The eye doctor was in disbelief too and sent us back to the specialist. Everyone was convinced that I was cheating the test in some way. They put tape all around a patch of leather and did the tests again.The result? I now had 80/20 vision. A percentage of my eyesight had been restored! I heard the doctor say (and he put in his report), that, "Short of an act of God, there is no way possible that she can see out of that eye but she can." and I can! I have always felt that I got the amount of healing in accordance with the amount of faith that I had that day. I believed my healing was incomplete and, so it was!God was not finished with me yet! It is important that we have and keep faith in God because God rewards you if you seek him diligently (doing it well, with great care, and being very thorough). If we do not have faith in God He is not happy with us. If you want to be rewarded (given recognition for your service, efforts, and achievements by God-You MUST have faith! If you keep God’s Commandments and do what is pleasing to God you can feel confident that you will receive what you ask for. Scroll down to get your free printable version which can be downloaded, linked to, or embedded on your website FREE and to take your Pop Quiz for this bible study. After you have completed all parts of the first lesson in our Faith bible study series you can proceed to Lesson 2. Click the button to go to your next lesson. 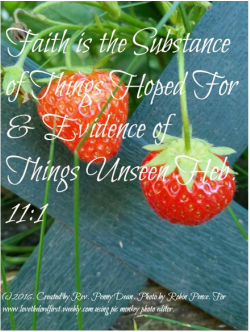 Go to Finding Your Faith Series: Part 2-There's Your Sign! Photo: (2016). Taken by Robin Pence. Edited by Rev. Penny Dean.